We’d love your help. Let us know what’s wrong with this preview of Ottolenghi SIMPLE by Yotam Ottolenghi. Bursting with colourful photography for every recipe, SIMPLE Yotam Ottolenghi’s award-winning recipes are always a celebration: an unforgettable combination of abundance, taste and surprise. SIMPLE is no different, with 120 brand-new dishes that contain all the inventive elements and favour combinations that Ottolenghi is loved for, but with minimal hassle for maximum joy. To ask other readers questions about Ottolenghi SIMPLE, please sign up. I pre-ordered this book, because Yotam Ottolenghi's recipes are almost always huge successes for me. I like his sense of flavor and some of the surprising combinations he comes up with. I thought this book would be perfect for weeknight cooking. Unfortunately, I find the recipes aren't so much "simple" as "less complicated, sometimes, but also frequently less flavorful". First, the good. I do like that he lays out his criteria and has a SIMPLE acronym to advise which recipes meet which criteria. I pre-ordered this book, because Yotam Ottolenghi's recipes are almost always huge successes for me. I like his sense of flavor and some of the surprising combinations he comes up with. I thought this book would be perfect for weeknight cooking. Unfortunately, I find the recipes aren't so much "simple" as "less complicated, sometimes, but also frequently less flavorful". First, the good. I do like that he lays out his criteria and has a SIMPLE acronym to advise which recipes meet which criteria. Unfortunately, it seems to be inconsistently applied throughout the book, but it's at least a start. He covers the basic pantry ingredients you'll need; I'm not sure I agree with all of them - for example, rose harissa is very difficult to find and quite expensive, at least in the US, and regular harissa works too - but it's nice to have that all covered in detail. And some of the recipes are very, very good, in typical Ottolenghi style. The rose harissa chickpeas with flaked cod are truly easy to make and extremely delicious. The lamb meatballs with feta are great for a weeknight, though you can bake them all the way through rather than fry+bake to make it even faster. There's a baked mint rice with an olive-pomegranate salsa - that salsa is 100% fantastic and I would eat it on anything. Very easy to throw together, too. The bad: A lot of the dishes just seem not quite complete. The slow-cooked chicken with crisp corn crust has turned out poorly for many people in a couple of cookbook clubs in which I participate. The crust seems to just kind of sink into a soggy mess. And the chicken itself is... I can see where he's going, but there are about fifteen other chili recipes I'd rather eat. The chicken marbella turns out with quite soggy skin, which could be remedied if he instructed air drying. Perhaps it's my American tastes but I don't prefer soggy poultry skin. The sauce itself was good but not amazing. The overall feel of the book just hasn't been inspiring to me the way Ottolenghi's other books are. Yotam Ottolenghi is a person who has changed the way people view food. Difficult to categorize, his style works on the premise that food is all about flavour and unorthodox combinations (prior to receiving Ottolenghi Simple I had made one of his recipes from an earlier cookbook -- Roasted Brussels Sprouts w/ Pomelo and Star Anise -- if this is not an unorthodox pairing, I'm not sure what is! But what I can say is that it was a flavor memory my mouth won't soon forget). His food is elegant because Yotam Ottolenghi is a person who has changed the way people view food. Difficult to categorize, his style works on the premise that food is all about flavour and unorthodox combinations (prior to receiving Ottolenghi Simple I had made one of his recipes from an earlier cookbook -- Roasted Brussels Sprouts w/ Pomelo and Star Anise -- if this is not an unorthodox pairing, I'm not sure what is! But what I can say is that it was a flavor memory my mouth won't soon forget). His food is elegant because it simply is, not because it's been styled to be so. But with the unexpected or unorthodox leads to some challenges sourcing ingredients. Maybe like some of you home cooks out there you've admired the Ottolenghi ethos but you've been intimidated by the ingredient list or the sophisticated-sounding recipe titles (more elevated than a simple home cook can easily achieve). I've found that while I'm drawn to the recipes they seem to be more in the category of "weekend cooking" (when you have the time to fuss over a recipe) rather than being something a home cook can work with in order to get a weeknight meal on the table. This being said and to be perfectly honest these aren't criticisms. In an answer to the humble, yet eager home cook we are given Ottolenghi Simple. In the introduction he says something that made me laugh, "I know, I know: I've seen the raised eyebrows, I've heard the jokes. The one about the reader who thought there was part of the recipe missing as they already had all the ingredients they needed in their cupboard. Or the one that goes, 'Just popping out to the local shop to buy the papers, milk, black garlic, and sumac!'" What this means for the home cook is that a uniquely Ottolenghi primer has been developed with accessibility at its core. Do the ingredient lists resemble my daughter's list to Santa (never ending)? Not at all! It was a pleasant surprise that the ingredient lists were moderate -- even coming in at 10 or fewer for many of the recipes! Can you cook from it on a weeknight and not see the hangry rage on the faces of your family as they wait for dinner to be served? Definitely! Even if you're feeling that the time between coming home from work and dinnertime is compressed there are loads of recipes to turn to. Is the Ottolenghi-ness diluted? Gosh no! Since receiving this book to review I've made some really delicious food. Nothing intimidating here -- just as they put it: "Recipes that give you the time to do everything else"! As soon as you open the cover you're met with an acrostic of the word "simple" -- S (short on time), I (ingredients: 10 or fewer), M (make ahead), P (pantry-led), L (lazy-day dishes), E (easier than you think). A more in-depth description of each is given in the introduction because each of these letters and meanings are used in conjunction with each recipe. When I made the Hot, Charred Cherry Tomatoes with Cold Yogurt, for example, the letters "S" and "I" appeared below the recipe title in order to indicate that this recipe was good if you're short on time and contained 10 or fewer ingredients. While some might find this strategy both novel and useful I didn't. At first, I thought I would really make use of this feature but in the end I'm not sure if I ever chose a recipe because of the letters or referred to the letters at all. The book is divided into 8 main chapters -- Brunch, Raw Veg, Cooked Veg, Rice, Grains, and Pulses, Noodles and Pasta, Meat, Seafood, and Dessert -- with a few sections added in which focus on simple menus (for everyday), special menus (for occasions), and what we've come to recognize as "Ottolenghi Ingredients" (Urfa Chile Flakes, Pomegranate Molasses, Sumac are a few I used and were easy to source -- the molasses I bought at Walmart). I went into this review owing three Ottolenghi cookbooks and having only tried one recipe (mea culpa!) to cooking 10 recipes right-zippity off the bat! Recipes worked out perfectly and were enjoyed by my whole family! What's not to like about that? The Buckwheat and Haricots Verts Salad was one of my favourites -- I loved the different textures here along with the fresh mint. My daughter loved the curried lentil soup. The Green Onion and Ginger Salsa from the Beefsteak Tomato Carpaccio is something so delicious that I needed to triple the next time I made it! One question that I've been asked is whether or not Ottolenghi Simple is suitable for vegan, vegetarian, and/or gluten-free diets. Speaking from experience as a vegetarian there are many, many recipes that suit. I had no troubles finding recipes to try. As for the other diets, this is addressed at the end of the book -- ""free-from" focus was not, this time, a priority" which is to say that there are vegan and gluten-free suitable recipes but there isn't any special index (etc.) to show this. Since this book is full of whole food ingredients and is focused on flavour I think there is a broad appeal -- you might just have to explore and seek out those recipes for yourself. The Brunsli Cookies are gluten-free (they use almond meal instead of flour which gives the cookies a very fudge-y texture when mixed with the chocolate and egg whites). Out of the ten recipes I've tried so far 7 of them were (or could be with some subbing) vegan and 3 relied on eggs in a way that you couldn't substitute for. I think that Ottolenghi has successfully translated what has made him so remarkable -- ingredients and flavour -- into something that is 100% accessible for the home cook without compromise. I would like to take this opportunity to thank Appetite by Random House / Penguin Random House for providing me with a free, review copy of this book. I did not receive monetary compensation for my post, and all thoughts and opinions expressed are my own. This has my minty baked rice with pomegranate and olive relish, which I make at least once every few months. It's incredible. The majority of this cookbook is vegetables in new and surprising ways. I really love the S-I-M-P-L-E concept. L-- Lazy cooking-- is my favorite, since it mostly involves throwing things into a pot or a pan and let it simmer away. Grosse déception pour moi. Les recettes sont peut-être "simplifiées" par rapport à Plenty et Jerusalem, mais on est loin de la série de recettes one pot permettant de cuisiner du Ottolenghi chaque soir de la semaine promise dans la description du livre. Il n'y a finalement pas beaucoup de recettes qui sont des repas en soi, et beaucoup de trucs qui doivent être combinés avec une ou deux autres composantes pour faire un repas complet. Vraiment pas le genre de livre de recettes de semaine auquel j Grosse déception pour moi. Les recettes sont peut-être "simplifiées" par rapport à Plenty et Jerusalem, mais on est loin de la série de recettes one pot permettant de cuisiner du Ottolenghi chaque soir de la semaine promise dans la description du livre. Il n'y a finalement pas beaucoup de recettes qui sont des repas en soi, et beaucoup de trucs qui doivent être combinés avec une ou deux autres composantes pour faire un repas complet. Vraiment pas le genre de livre de recettes de semaine auquel je m'attendais. SIMPEL staat eenvoudigweg voor Snel - niet meer dan 10 Ingrediënten - Maak van tevoren -Provisiekast - Eenvoudiger dan u denkt - Lui: elk recept kreeg 1 of meerdere van deze labels. Persoonlijk kijk ik hier niet echt (of zelden) naar, ik beschouw het gewoon als een weer erg goed Ottolenghi-kookboek, vol erg lekkere recepten. Én een schitterende cover! Waar Ottolenghi’s Plenty-kookboeken enkel om groenten draaien, staan in dit boek ook recepten met vlees en vis. De recepten blijven fijn om te make SIMPEL staat eenvoudigweg voor Snel - niet meer dan 10 Ingrediënten - Maak van tevoren -Provisiekast - Eenvoudiger dan u denkt - Lui: elk recept kreeg 1 of meerdere van deze labels. Persoonlijk kijk ik hier niet echt (of zelden) naar, ik beschouw het gewoon als een weer erg goed Ottolenghi-kookboek, vol erg lekkere recepten. Én een schitterende cover! Waar Ottolenghi’s Plenty-kookboeken enkel om groenten draaien, staan in dit boek ook recepten met vlees en vis. De recepten blijven fijn om te maken, toch soms een uitdaging, ook qua ingrediënten (maar er worden vaak suggesties voor alternatieven gedaan). Leuk is ook het overzicht van de ingrediënten, en de inleiding tot elk recept. Pros: Just. Wow. I borrowed this cookbook from the library, expecting to get maybe a week's worth of meals out of it, but I got two weeks' worth, and I want to keep trying more recipes. Every. Single. Recipe. Was SO solid. Great flavors, great techniques, great challenges. Lots of beautiful photos. 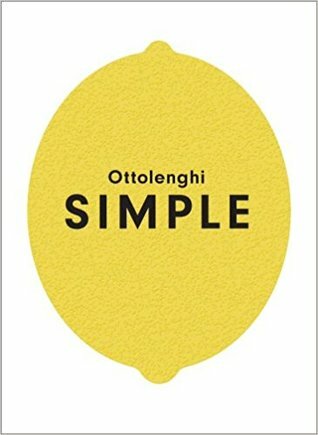 Cons: I know the title of the book is "Ottolenghi Simple," and, readers might not realize until they delve in, but SIMPLE is an acronym. S = Short on Time. I = Ingredients: 10 or fewer. M = Make ahead. P = Pantry-led. L = Lazy-day dishes. E = Easier than you think. Each recipe earns at least one of these labels, but I did find that some recipes were still very involved and took a long time, which didn't feel simple to me. Also, I learned quickly to cut back on the oil. Ottolenghi has a heavy hand. No, thank you: I tried close to 20 recipes and would make each one again. I've enjoyed Ottolenghi's other cookbooks, but this one actually is simple. I've made two recipes and friends made two others - all were delicious. I borrowed this from my library, but it's going in my shopping bag. imo, it's worthy of shelf space in my little kitchen. Simple yet exciting recipes as the title indicates . Brilliant and colourful photos . need to try out the recipes next . As always, very attractive cookbooks from Ottolenghi. But sadly for my location and stage of life, it is more of a coffee table book. I’d give a lot to eat at his restaurant though! I think the title is misleading. Not simple in any way. Disappointing. Great simple recipes which are 10 ingredients or less. Have already cooked a few of these and love it. A real disappointment. The first few books--Ottolenghi, Jerusalem, and Plenty--were all packed with delicious recipes for beautiful foods. I own them all and use them all, and have rated them Five Stars here and elsewhere. I love them, truly. But this one? I am only interested in making four dishes, and that's because they're much like other recipes from previous books. A lot of dishes use rose harissa, which I don't like at all. Other herb and spice combinations are a bit lengthy for a cookbook A real disappointment. The first few books--Ottolenghi, Jerusalem, and Plenty--were all packed with delicious recipes for beautiful foods. I own them all and use them all, and have rated them Five Stars here and elsewhere. I love them, truly. SIMPLE : Short on time, Ingredients: 10 or less, Make ahead, Pantry, Lazy, Easier than you think! Simple. Have all the books except the Sweet as we don’t eat dessert unless out somewhere. They are amazing cookery books and like fabulous reference books to the cuisines mixed therein. BUT often way too difficult and complicated for me, a home cook. Simple is exactly the answer. Amazing approachable and very doable cookery with great ingredients and truly delicious results. Cannot recommend it more! SIMPLE : Short on time, Ingredients: 10 or less, Make ahead, Pantry, Lazy, Easier than you think! Simple. In Yotam Ottolenghi's latest cookbook, OTTOLENGHI SIMPLE, the simple isn’t just a euphemism for “everyday” or “weeknight cooking” or “30 minutes or less.” SIMPLE is the system underlying the recipes. Short on time, 10 Ingredients or less, Make ahead, Pantry, Lazy or Easier Than You Think. It’s up to you to choose based on your cooking agenda on any given day. I tested a handful of recipes from across the book and consistently the recipes were easy and delicious, but still very Ottolenghi. Among our favorites so far: Hot Charred Cherry Tomatoes (recipe available in the publisher's excerpt), Harissa Roasted Baby Carrots with Pomegranate and the Spiced Apple Cake. I’ve cooked from several “everyday” type books in the last few years, including Alton Brown's EveryDayCook and Smitten Kitchen EveryDay. Ottolenghi SIMPLE is a winner with fresh inspiration for the busy home cook. This collection is the one I’ll be coming back to again and again. I am completely biased as I think Yotam Ottolenghi is currently the most influential food writer, recipe developer and chef. His name has become synonymous with a style of food that beloved fans instantly recognise. He has, through each of his books Plenty, Plenty More, Jerusalem and now Simple, taken us on a culinary journey through the Mediterranean mostly making vegetables the hero. He has introduced us to delicious ingredients, foods and flavors and most importantly has made them delicious a I am completely biased as I think Yotam Ottolenghi is currently the most influential food writer, recipe developer and chef. His name has become synonymous with a style of food that beloved fans instantly recognise. He has, through each of his books Plenty, Plenty More, Jerusalem and now Simple, taken us on a culinary journey through the Mediterranean mostly making vegetables the hero. He has introduced us to delicious ingredients, foods and flavors and most importantly has made them delicious and 'doable' for the home cook. Anyone who has tasted roasted eggplant with a dollop of creamy yoghurt or who craves for roasted cauliflower with green tahini sauce should thank Ottolenghi. His latest book, Simple, combines everything that has become staple Ottolenghi (ingredients and flavours) but is a collection of recipes that are easy and effortless. This means lots of delicious food that can be prepared ahead, or sourced from your pantry or whipped up for a tasty week night dinner or can be prepared in a single dish. You will not be disappointed with this latest (and best) offering. There is everything to love about this book and this chef! Cauliflower "tabbouleh" (p.46), Pumpkin, saffron and orange soup (p.54), Roasted whole cauliflower (p.94 for the technique), chraimeh sauce (p.104), whole-roasted celery root with coriander seed oil (p.128), Honey and yogurt set cheesecake (p.208) and Brunsli chocolate cookies (p.290). There were two interesting ideas, one about adding ricotta to meatballs... I think that would work well when using meat that was too lean, or even adding a smoother mouth feel to a meatball. The other was cooking meatballs in a lemon and chicken stock. Reminds me of a recipe I had for Lion's Head Meatballs. This is my desert island cookbook, as long as the island has a store selling a profusion of fresh vegetables, fruits, and Middle Eastern, Asian, and Italian ingredients. I certainly haven't cooked all the dishes, which might take a year or two, but reading them was a torturous experience as I drooled onto my virtual silk tie. I can honestly say that not a single dish, from Raw Veg to Dessert was less than delicious. I could taste them in my culinary imagination! Their simplicity, creativity, and This is my desert island cookbook, as long as the island has a store selling a profusion of fresh vegetables, fruits, and Middle Eastern, Asian, and Italian ingredients. I certainly haven't cooked all the dishes, which might take a year or two, but reading them was a torturous experience as I drooled onto my virtual silk tie. I can honestly say that not a single dish, from Raw Veg to Dessert was less than delicious. I could taste them in my culinary imagination! Their simplicity, creativity, and goodness (anything to avoid talking about health and wellness) is obvious. The few potentially unfamiliar ingredients (no pickled breast of Himalayan crevasse dove here) are described in detail at the end of the book, including advice about what to look for and where to find them. Thank Cod that Ottolenghi and his recipe wranglers did not try to be authentically anything (so depressingly 20th century) but combined strong elements of Middle Eastern cooking with Chinese and Italian. We are, after all, so cosmopolitan. Sinds ik vorig jaar Plenty heb gekregen voor Kerst, heb ik aardig wat Ottolenghi gerechten gemaakt. Toen Simpel uitkwam wilde ik dan ook het liefst meteen naar de winkel rennen om het boek te kopen maar heb ik toch even gewacht of ik dit boek niet cadeau zou krijgen. Et voilà, ook dit jaar was het met Kerst raak. Wat een prachtig boek is dit toch weer, met deze keer de focus op gerechten die op de een of andere manier simpel te maken zijn; snel, makkelijk grotendeels voor te bereiden, of met een Sinds ik vorig jaar Plenty heb gekregen voor Kerst, heb ik aardig wat Ottolenghi gerechten gemaakt. Toen Simpel uitkwam wilde ik dan ook het liefst meteen naar de winkel rennen om het boek te kopen maar heb ik toch even gewacht of ik dit boek niet cadeau zou krijgen. Et voilà, ook dit jaar was het met Kerst raak. Wat een prachtig boek is dit toch weer, met deze keer de focus op gerechten die op de een of andere manier simpel te maken zijn; snel, makkelijk grotendeels voor te bereiden, of met een groot deel ingrediënten die standaard in je voorraadkast staan. De foto's zijn wederom prachtig en ook de hoeveelheid salades vind ik persoonlijk erg fijn (ik probeer iedere dag voor de lunch een salade te maken, maar hiervoor inspiratie vinden is nog best lastig!). Maar er staat zoveel meer in dan dat! Ik zou dit boek zeker aanbevelen voor degenen die op zoek zijn naar wat nieuwe recepten om hun kookrepertoire mee uit te breiden zonder dat het meteen gecompliceerd moet worden. However, not my style. I prefer to only keep cookbooks that I use frequently, or need as backup (ahem, The Food Lab - swoon!). Admittedly, I'm a simple cook - I love recipes that have 10 or less ingredients (including oil, salt and pepper!) and generally call for things I have in my cabinet (I do consider zatar, farro & fresh cilantro some of my key staples so I'm not totally lazy). However, I found that most of the recipes were more complicated and required more grocery planning then I have capacity for (baby, full-time job, blah blah blah). While reading the Introduction to this recipe book I was initially confused, until I realised that it assumed I knew who and what Ottolenghi is. It expected me to find the idea of a "simple Ottolengi" recipe hilariously oxymoronic. But I got this book as a Christmas present, and have never heard of an Ottolenghi. I am now determined to spend the rest of my life making sure I never find out who Ottolengi is or what he/she looks like. I = 10 While reading the Introduction to this recipe book I was initially confused, until I realised that it assumed I knew who and what Ottolenghi is. It expected me to find the idea of a "simple Ottolengi" recipe hilariously oxymoronic. But I got this book as a Christmas present, and have never heard of an Ottolenghi. The latest Yotam Ottolenghi cookbook makes great play of the reduced ingredients list for the recipes. This is possibly daunting if you aren't familiar with previous Ottolenghi books which need dozens of ingredients, some seemingly only available on line or from specialist groceries. SIMPLE has a list of basics which are needed for the recipes, and I have found all of them in local (rural) supermarkets. So far we've made several of the baked rice recipes, a white fish and chickpea curry and have p The latest Yotam Ottolenghi cookbook makes great play of the reduced ingredients list for the recipes. So far we've made several of the baked rice recipes, a white fish and chickpea curry and have plans to try many more. The instructions are clear, the photos are gorgeous and the recipe quantities are spot-on. If the recipes says that it serves 4 people, there are 4 good portions there. This isn't a book you read as much as you leaf through it, finding recipes to highlight and dog-ear and to come back to again and again. As with any Ottolenghi book, it's beautifully photographed and the recipes are absolutely delicious. Don't be fooled into thinking that this is an "easy" cookbook - there is still time and deliberation included as part of the process, but the results are well worth the attention to detail. I'll be coming back to this one over and over. Tasty and healthy meals. I loved everything I made thus far. The pictures are stunning. Perfect for the coffee table. I like how most of the dishes involves vegetables. The meals are very kind to the waistline. The recipes aren't labor intensive, however it goes pretty heavy on ingredients. Luckily I had some on hand. I wouldn't recommend this book for beginner cooks. If you like Mediterranean or Middle Eastern cuisine....give it a go. quite simply, a fantastic cookbook. presentation, photographs, layout, even the thickness of the paper stock are all excellent. but what really stands out are the fabulous recipes. Yotam Ottolenghi is a genius at pairing Mediterranean spices, vegetables, fruits, nuts, and, to a lesser extent, meats and fish, in marvelous ways. his versatility with yogurt -- an ingredient i'm not fond of ... yet -- is amazing. it's an exciting read! This book is what I have come to expect from Ottolenghi, and also somewhat of a surprise, in that there are new things in here compared to the other five savory cookbooks, and the first six things we made were just spectacular. I use him more for vegetable dishes, which I like to have 4-6 of at a nice family weekly dinner, but the meat dishes also look quite good. The recipes ARE simple but the ingredients can be tricky. I feel the za’atar craze has sufficiently took the world by storm though, so it should be easy enough to wrangle the things you need at specialty grocery stores (or the internet). Really anxious to tear into some of these pasta dishes. His use of anchovies, olives, and capers for salt are great. Yotam Ottolenghi's path to the world of cooking and baking has been anything but straightforward. Having completed a Masters degree in philosophy and literature whilst working on the news desk of an Israeli daily, he made a radical shift on coming to London in 1997. He started as an assistant pastry chef at the Capital and then worked at Kensington Place and Launceston Place, where he ran the past Yotam Ottolenghi's path to the world of cooking and baking has been anything but straightforward. Having completed a Masters degree in philosophy and literature whilst working on the news desk of an Israeli daily, he made a radical shift on coming to London in 1997. He started as an assistant pastry chef at the Capital and then worked at Kensington Place and Launceston Place, where he ran the pastry section. Yotam subsequently worked for Maison Blanc and then Baker and Spice, before starting his own eponymous group of restaurants/food shops, with branches in Notting Hill, Islington and Kensington.